"I'm not a girl trying to be a star…" A24 has debuted the official trailer for Asif Kapadia's documentary Amy, the story of English musician Amy Winehouse who died at age 27 in 2011. This trailer is timed with the film's big premiere at the Cannes Film Festival this week, where it's finally unraveling even though they seem to already have quotes galore in the trailer. 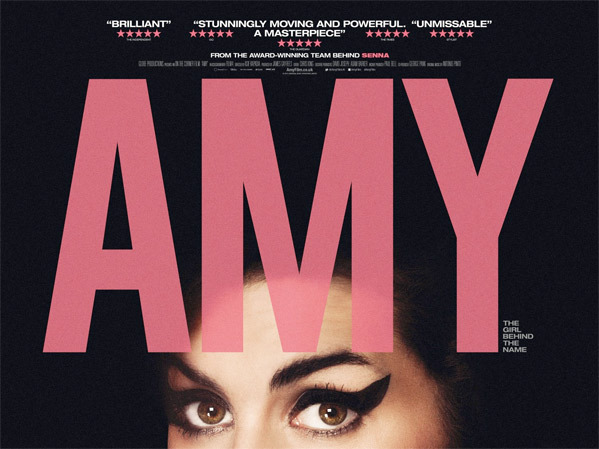 From the director of Senna (a fantastic doc), Amy presents an inclusive look at the life of singer-songwriter Amy Winehouse, including the story of her success and subsequent downfall. Early word is that it's another excellent doc from Kapadia, delving deep into the mind of someone as talented as Winehouse. I'm looking forward to catching this soon; opens in theaters this July. From director Asif Kapadia (of Senna previously), Amy tells the incredible story of six-time Grammy-winner Amy Winehouse – in her own words. Featuring extensive unseen archive footage and previously unheard tracks, this strikingly modern, moving and vital film shines a light on the world we live in, in a way that very few can. A once-in-a-generation talent, Amy Winehouse was a musician that captured the world’s attention. A pure jazz artist in the most authentic sense – she wrote and sung from the heart using her musical gifts to analyse her own problems. Her huge success, however, resulted in relentless and invasive media attention which coupled with Amy’s troubled relationships and precarious lifestyle saw her life tragically begin to unravel. Winehouse died from alcohol poisoning in 2011 at the age of 27. After premiering at the Cannes Film Festival, A24 will open Amy in NY/LA starting July 3rd this summer. For more, visit the official site. I don't really get it. Amy and her life sound about as interesting as someone like Lady Gaga's (dealing with massive fame), the main difference basically being that she became an addict and overdosed at 27. She had a fantastic voice and I enjoy her music, but that doesn't really warrant a biopic on her, as far as I can see (nor the weird idolization by the media+public). Her popularity in life cemented her popularity in death. You really don't like her, huh? Oh dear. As much as I don't like any one who selfishly kills themselves through drug use, this documentary looks to be one of the best of the year. It will be interesting to see how her support network fell apart, there didn't seem to be anyone looking out for her.